2019 has kicked off with some beautiful Jubilee items already this year up for sale in auctions and not only in the UK! I spotted this rarity come up in the Spink China in their sale of The Lam Man Yin Collection of Small Dragons, Dowagers and 1897 Surcharges on January 18th. 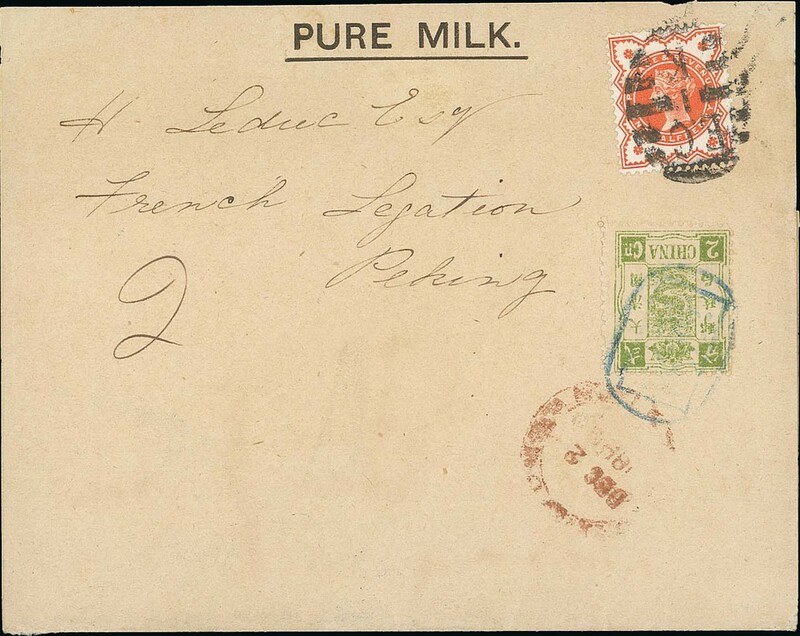 This cover (lot 685) was sent underpaid to the French Legation in Peking, China, and franked on arrival with a 2ca Dowager tied by a Tientsin seal in blue with Customs circular datestamp below. 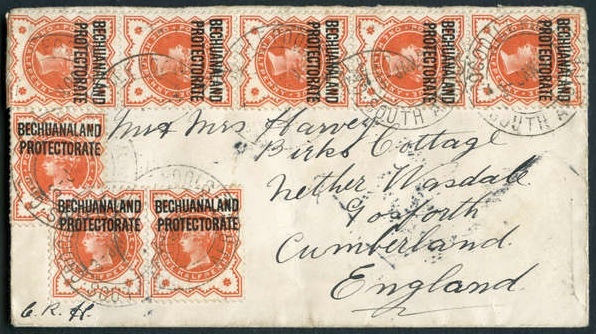 Noted as being one of only 26 incoming covers (presumably franked with a 2ca for postage due), it was estimated at HK$50’00-60’000 (around £5’000), it was hammered down for HK$180’000! (about £17’500). 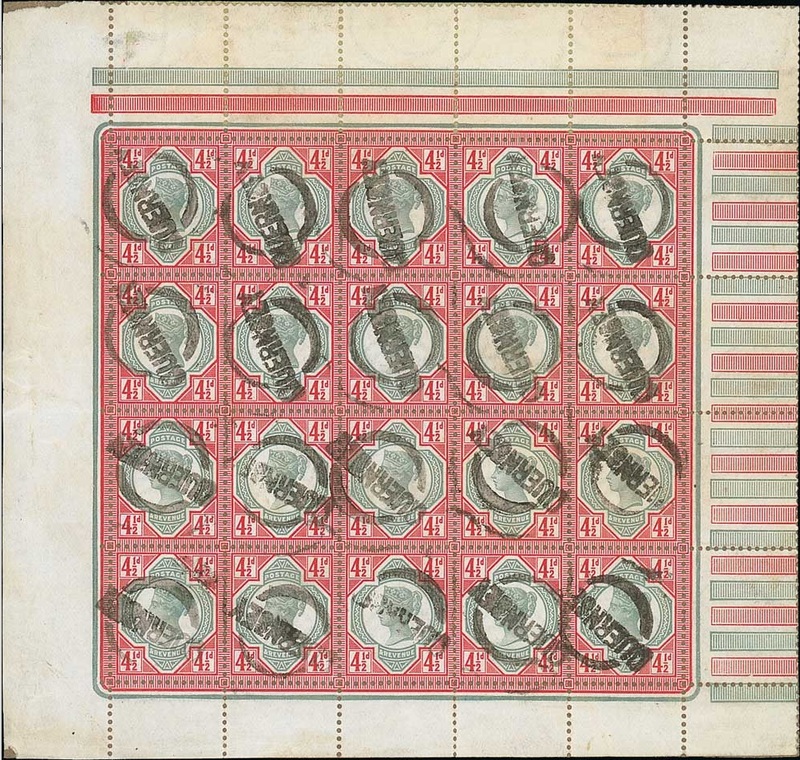 Almost certainly making it the most expensive 1/2d vermilion franking in existence! 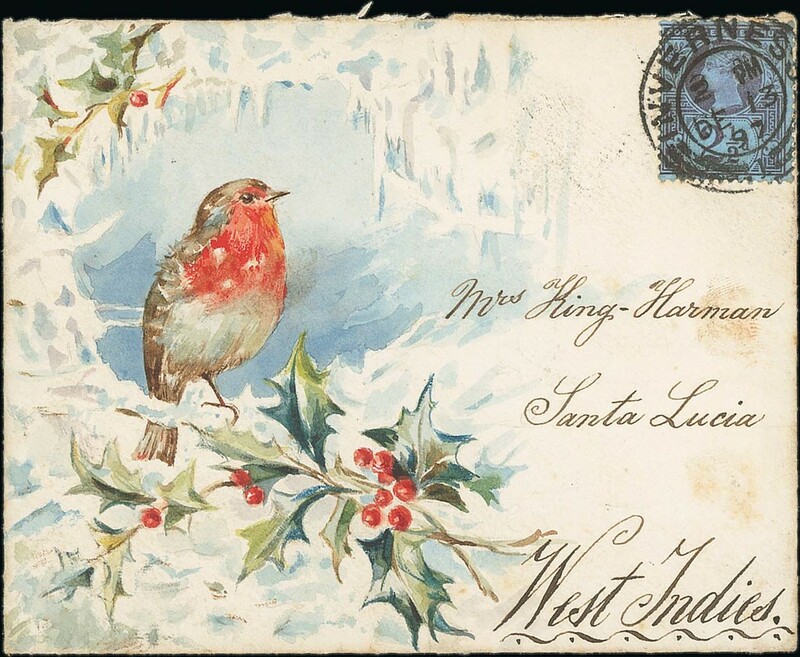 This beautiful cover from the famous King Harman correspondence depicting a Robin on a holy branch was sold by Spink in London for £1’500 plus commission (lot 2466, January 22nd-23rd), which was a strong price even compared to the results of the Ramsey collection of hand-painted envelopes they sold last year. One cover I did get though was in the Magpie Postal Auction on February 27th. 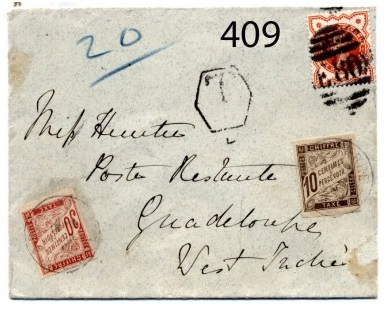 Lot 409 was a 1/2d vermilion going to Guadeloupe, sent underpaid and franked with 40c of French Colonies postage dues on arrival. 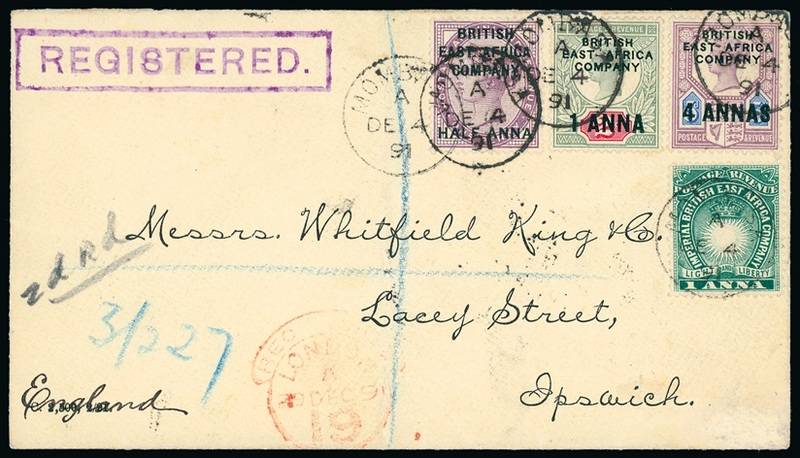 British mail to the French Colonies in this period is surprisingly scarce and this is the only cover I’ve seen going there. Estimated at only £25, I was very pleased to get it for £143 including fees. 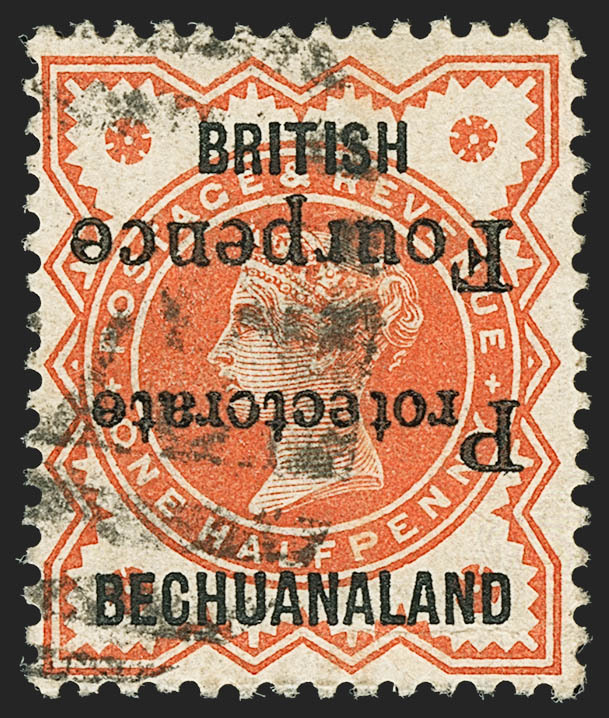 The Bechuanalands & Botswana Society is holding a postal auction of 132 lots which closes on 1st March 2019. 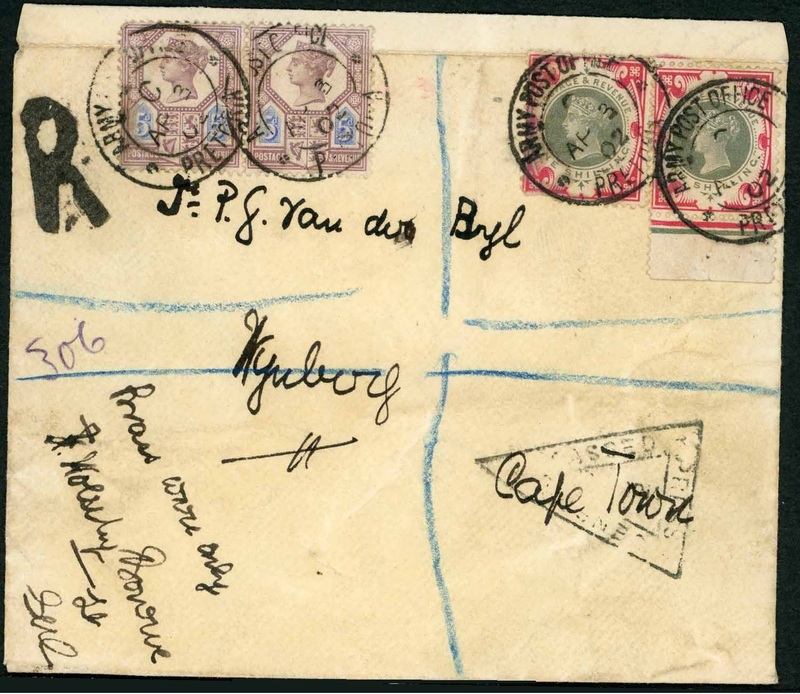 It features a section of Joe Taylor’s collection with many of his used stamps which have been carefully selected for their postmarks. Last week David Feldman in Switzerland sold the “Koi” collection of the Bechuanalands, and I had the pleasure to describe and lot it for the auction! 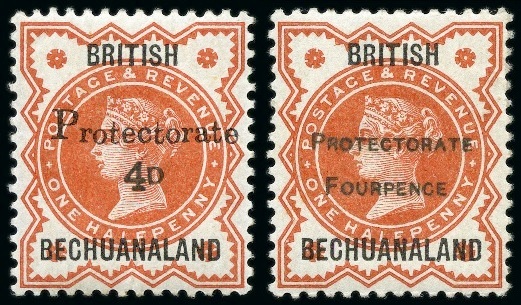 There were many overprinted Jubilee stamps including essays, specimens, controls and postal history. Little is known about these essays produced by Messrs. Townshend. Mention of them is made in Holmes’ book but he doesn’t illustrate any. From what I’ve found appearing in auction catalogues over the years, there seems to be three types; “PROTECTORATE / FOURPENCE”, “Protectorate / 4D” and “Protectorate / 4d”. Staying with the Fourpence surcharge issue, the following two varieties also saw strong competitive bidding. 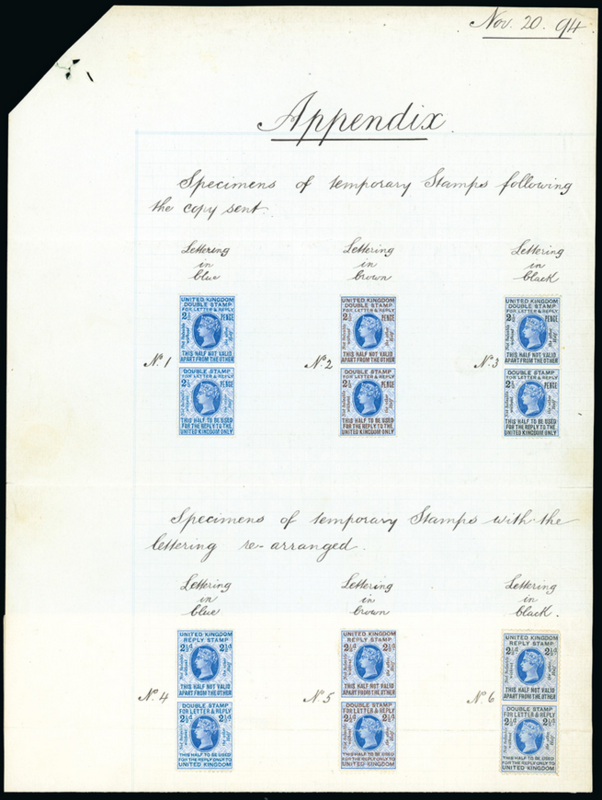 Lot 30423 has the green surcharge variety, which was the result of faulty cleaning of the inking roll. 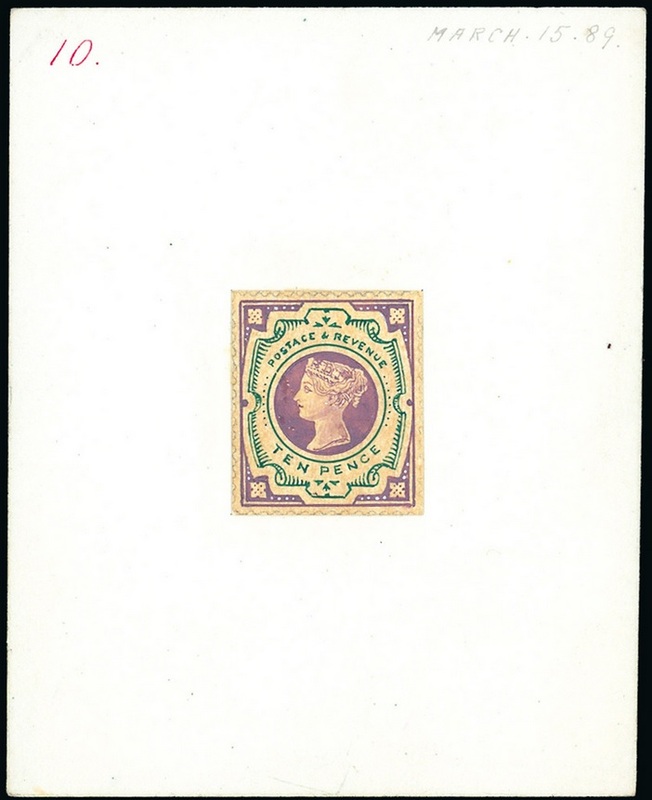 Although not listed by Stanley Gibbons, it is mentioned and priced at £1’500 in the footnote for this stamp. It sold for £1’159. All the known examples are used in Shoshong, and this is only the fourth example I have found. More well known is lot 30424, the inverted surcharge variety (SG.53c, £4’000). This example is one of 19 I have found in auction catalogues and literature and sold for a solid £2’074. 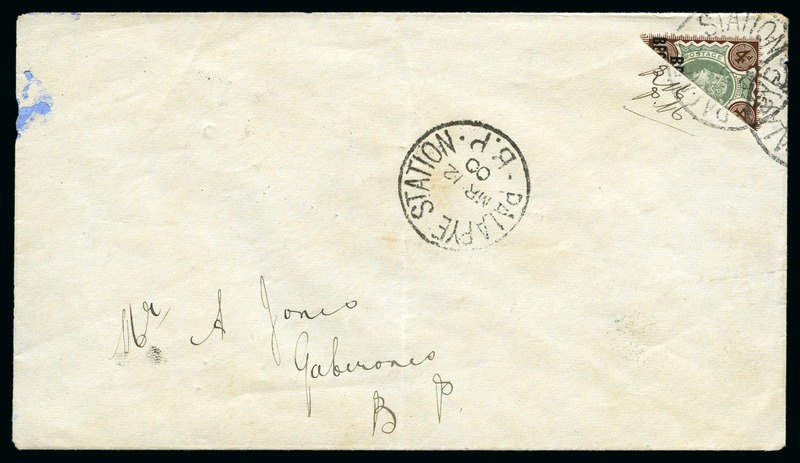 On the postal history side of things was lot 30401, this interesting bisect of the 4d from Palapye Station. Again from my brief research I have so far found 9 examples. 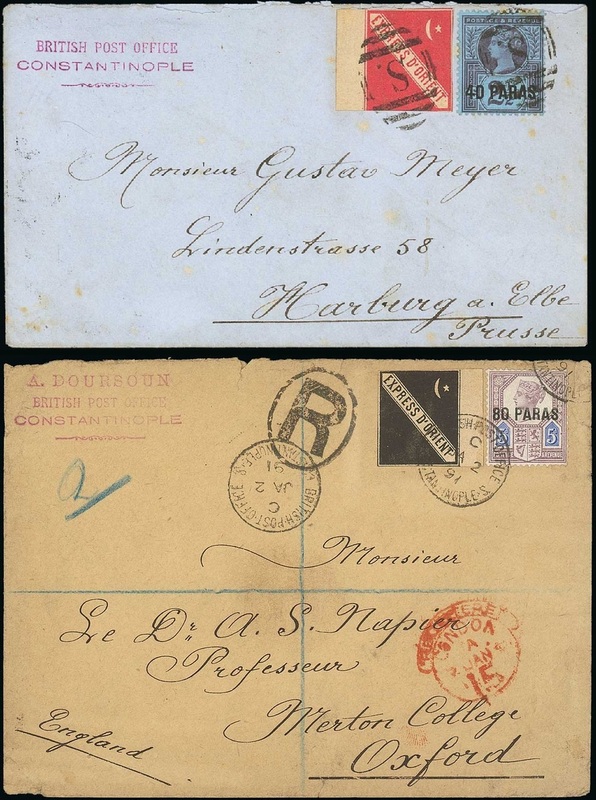 Although undoubtedly philatelically contrived, they have only been recorded on November 22nd 1899, December 13th 1899 and March 12th 1900. This is one of only two used on March 12th, and unusually both are diagonally bisected as opposed to the rest which are vertically bisected. It sold for £854. And I’ll finish with one item which sold for multiples of the estimate. 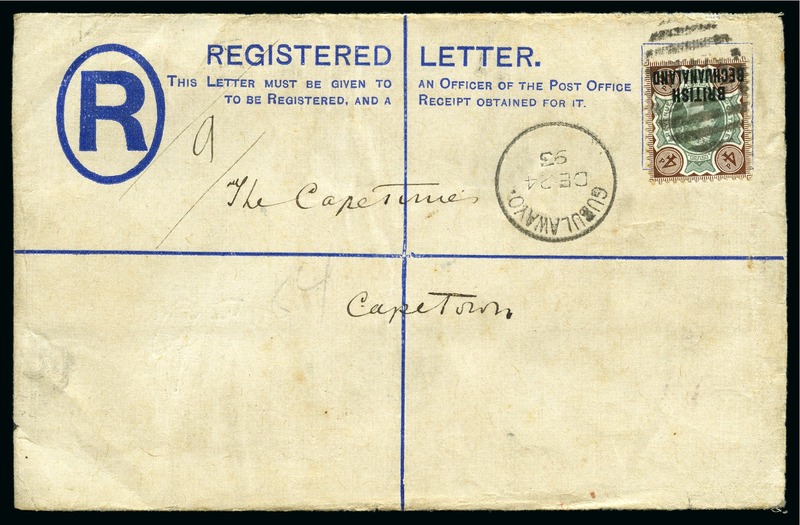 Lot 30474 is a cover from Gubulawayo during the Trans-Protectorate period, and shows the Gubulawayo cds with “MASHONALAND” excised (if I remember rightly). Estimated at £200-300, it sold for £1’342 including buyer’s premium. A rarer cancel than I realised. 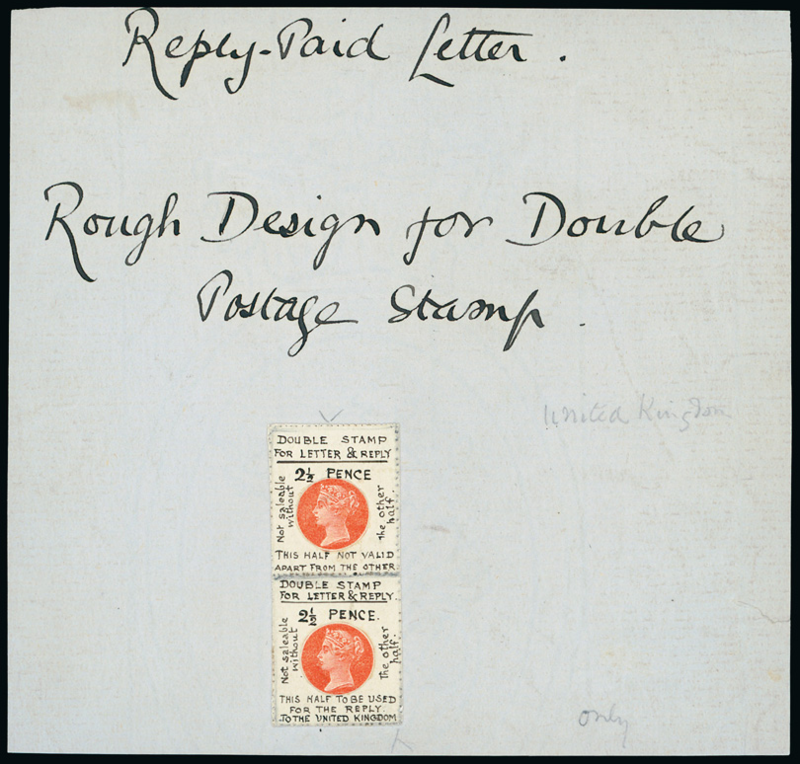 On the 8th and 9th of May, Spink sold the magnificent collection of hand-painted envelopes belonging to Dr Paul Ramsey, which featured many exquisite covers bearing Jubilee frankings from the famous King Harman correspondence. The collection was in fact gifted to the Royal Philatelic Society and sold on their behalf, in order to help finance their “Tomorrow’s Royal” appeal and the refurbishment of their new premises. The prices realised were strong, as I noticed some fetching more than double what they had realised in recent years. 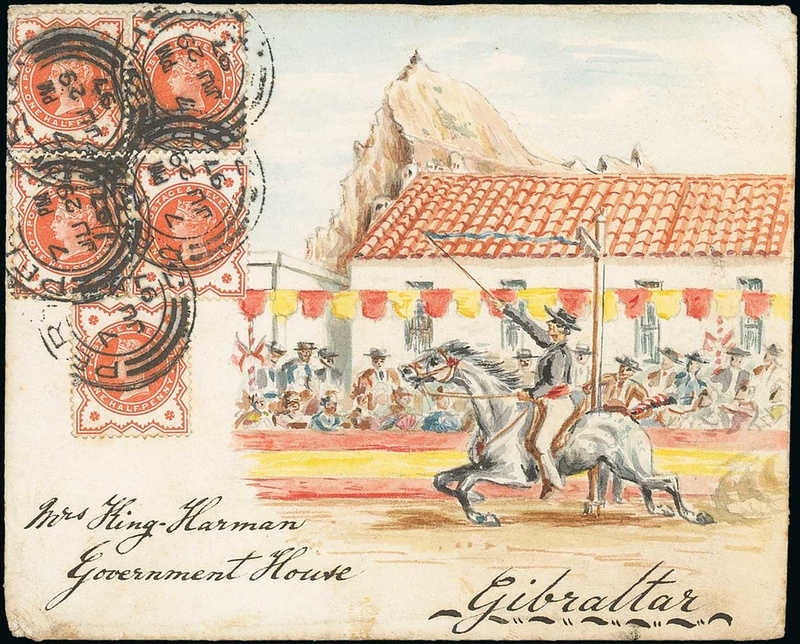 Lot 125 for example, the cover depicting a horse rider in front of Gibraltar Rock sold for £480 plus commission in 2011, but realised £1’300 plus 20% this time. 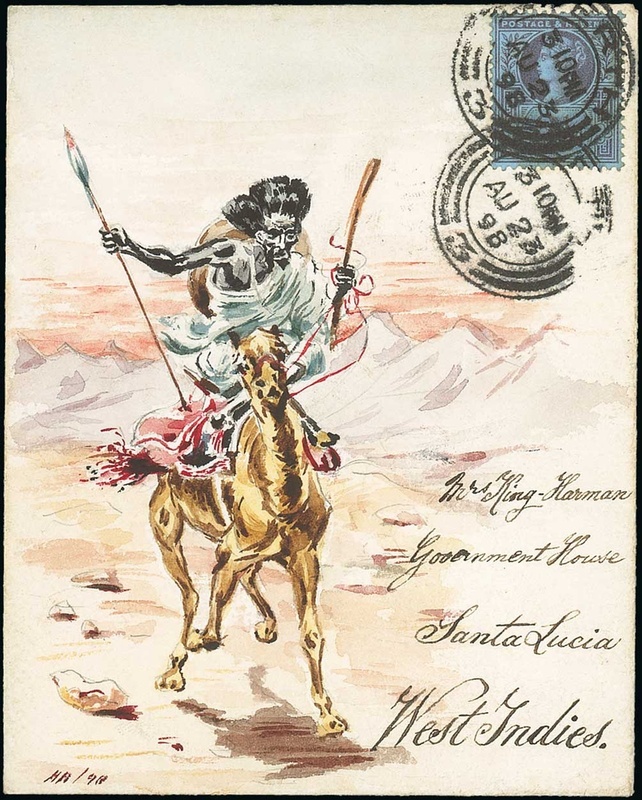 A couple of my favourites included lot 132, which depicted an African warrior on camel back which sold for £800 plus 20% commission. Siegel sold this cover when the offered the Grunin collection in 2010 and it sold for $350 plus commission. 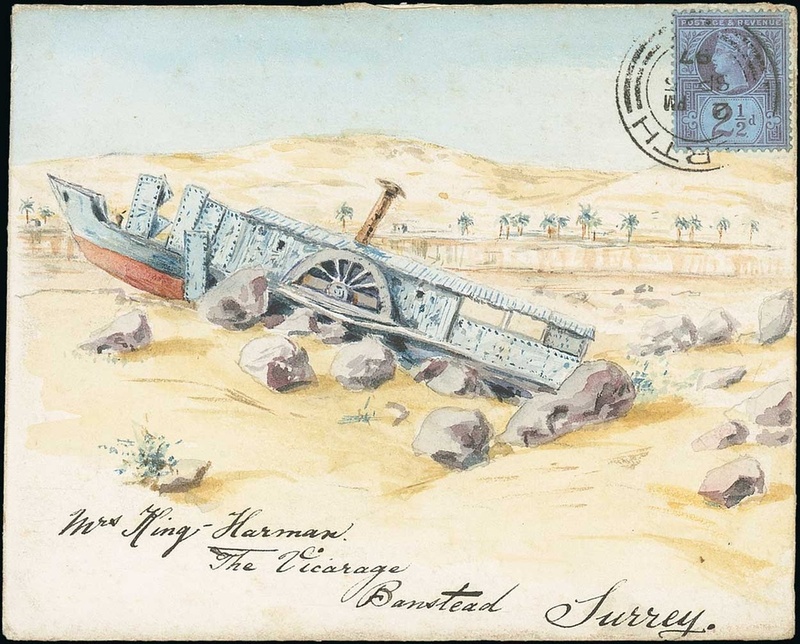 As well as lot 127, which depicted a stranded paddle steamer in the desert. An image very much reminiscent of the stranded ships you see on the “Skeleton Coast” of Namibia (hammer price £1’000). 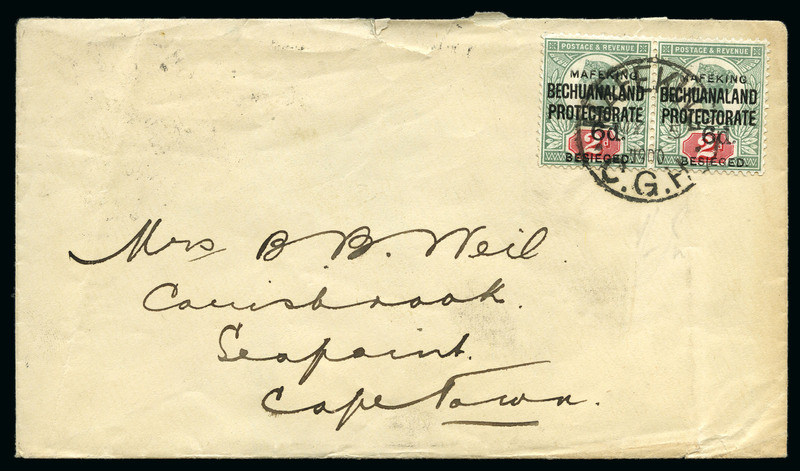 The envelopes were addressed to the wife of Sir Charles Anthony King-Harman, who (according to thepeerage.com) served as Colonial Secretary in Mauritius between 1893 and 1897 and Administrator of Saint Lucia from 1897 to 1900. The artist was Lt-Col Hugh Rose, 24th of Kilravock, CMG, who commanded the 1st Battalion Black Watch and fought in the Nile Expedition 1884-1885, the Boer War 1901-02 and WWI (again, according to thepeerage.com). According to the Siegel catalogue of the Grunin collection, Captain Rose developed a close relationship with the King-Harman family while he served as aide-de-camp to Charles King-Harman in Mauritius during the early 1890s. In the absence of anything worthwhile appearing on eBay, I thought I would talk about a few nice Jubilee items that have sold in auction this past month. 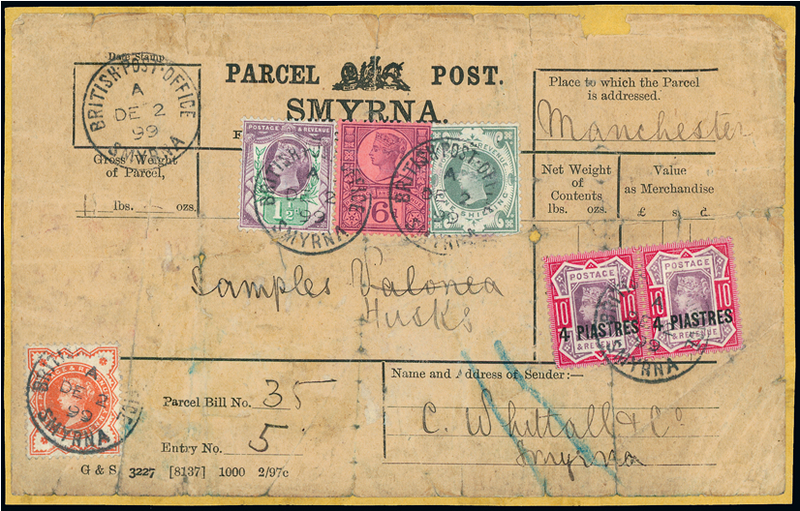 Starting with Grosvenor who offered the Richard Malim collection of British Levant on September 20th, including this attractive parcel label Lot 600 was this attractive albeit fragile official parcel label, with a mixed British and Turkish currency franking, for a package of acorn husks sent to Manchester. I’ve only seen a couple of these before, so I was disappointed to be the underbidder when it sold for £600 plus commission. Spink offered another portion of the David Pitts collection, with their September 19th sale focussed on the West Indies. Not the normal place to find Jubilee items but it did throw up this cover franked with a ½ vermilion sent to the Cayman Islands. 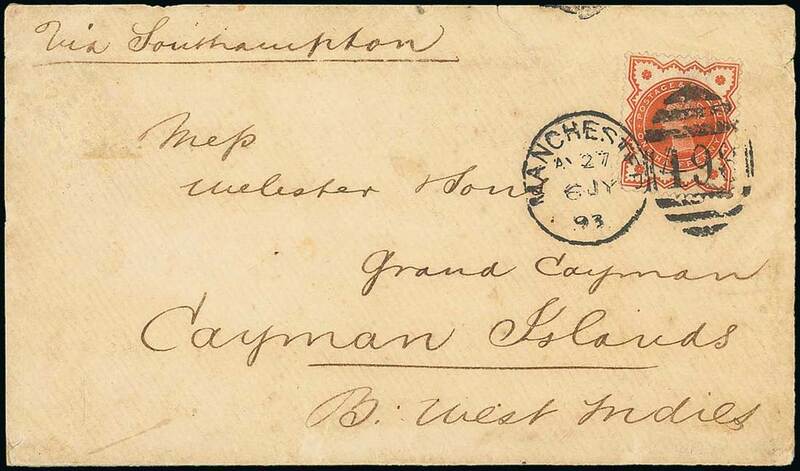 It has a backflap missing and is a bit worn, but it has a Grand Cayman arrival backstamp. It sold for £1’200 against an estimate of £1’500-1’800 and it’s the only Jubilee cover I have recorded going there. 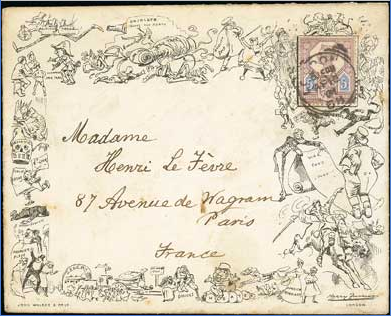 And lot 1205 in the Argyll Etkin auction on September 29th saw this Furniss “New Century” envelope, sent from London to Paris with a 5d Jubilee sell for £400 plus 21% buyer’s premium. It was the first time I’d actually seen this envelope. Let’s hope October brings us some more lovely Jubilee items! 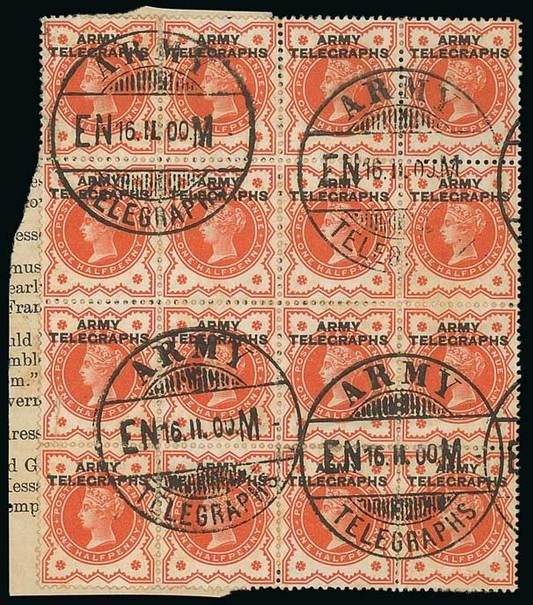 In Grosvenor and Spink this April, the following Army Telegraphs overprinted Jubilees turned up within a week of one another. The first to come up was this impressive used block of 16 still on piece. Unfortunately it was part of a larger lot (lot 2099) with other Army Telegraph issues, so my top bid was a bit far off lot the final hammer price of £2’200. It’s the largest multiple I’ve seen by far! 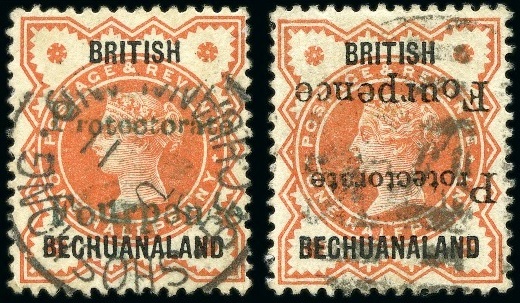 (The second being a block of four that sold on ebay in February). 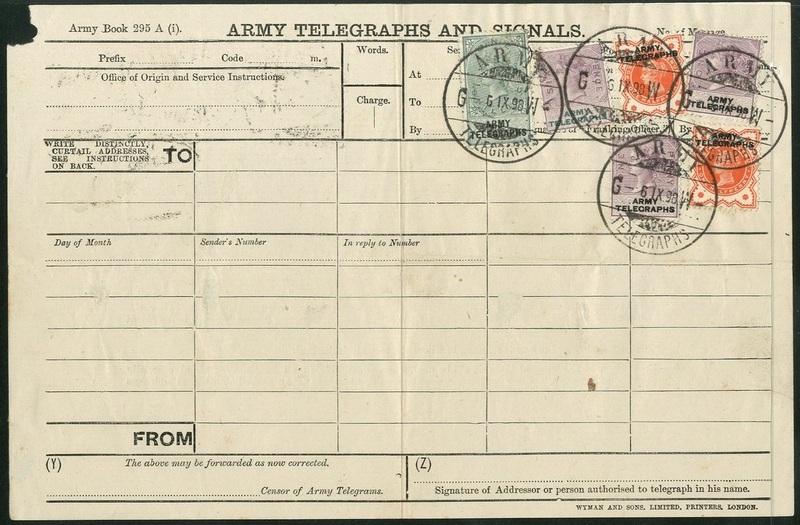 Next up was lot 2106, an unused telegram form franked with various Army Telegraph issues including two overprinted 1/2d vermilion Jubilees, which dates from when the Army was doing manoeuvres on Salisbury Plain. I was a bit closer this time with my bidding but was still beaten to the final hammer price of £380. 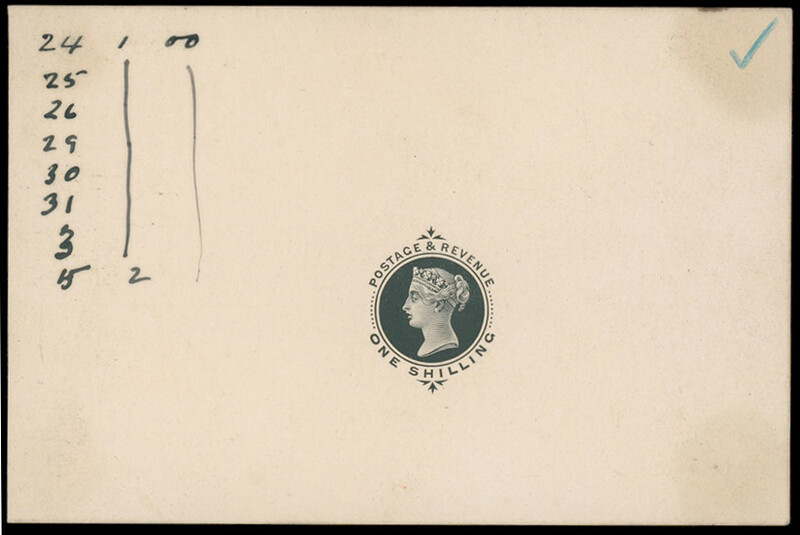 This was the first complete and franked telegram form I have seen but I’ve heard they exist. 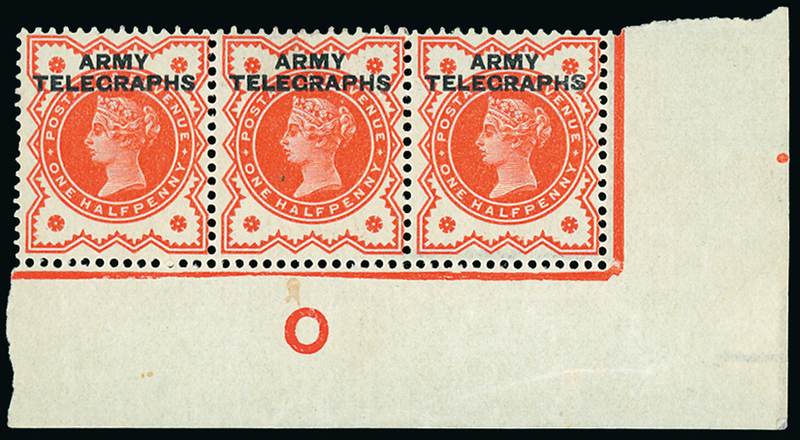 And finally Grosvenor had this mint 1/2d vermilion “O” control strip of 3, lot 137 estimated £100-150. This was one I really wanted and even used an agent for the first time to bid in the auction room on my behalf. Disappointment turned to despair as my top bid was surpassed by a measly £50 and it sold for £1’250. This is only the second I have seen (which was corroborated by a dealer I know).